There is something about large cuts of meat that is just amazing. 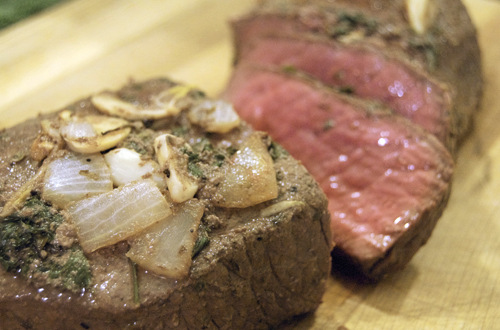 I always feel like a large tenderloin or roast is always much juicier and flavorful than individual pieces of meat. Lucky for me, my mom belongs to a local farm and receives ungodly amounts of meat. I have had a two-pound hunk of beef in my freezer tantalizing me for months. I had not gotten around to cooking it because I did not want to cook the entire thing for only two or so people. This weekend I finally had the chance to have a dinner party, if you want to call it that, and serve this delicious cut of meat to a group of friends. 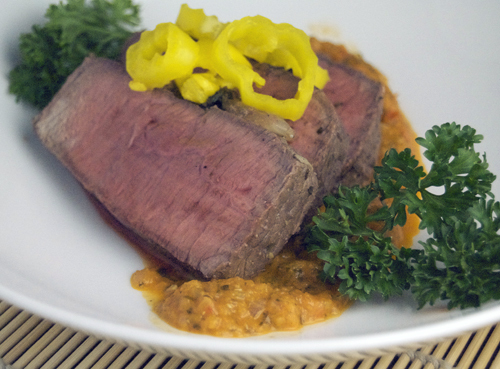 The marinating portion of this recipe gives the meat delicious flavor and makes it extremely juicy when you broil it. Be prepared to start this recipe early in the day because the longer you marinate the meat, the better it will taste. I also really like the sauce that I made for this recipe because it is not your average beef sauce. I thought about doing a Hollandaise, Béchamel or horseradish sauce but they all just seemed too common. Instead, I decided to explore and find my own, lighter, sauce; I ended up choosing this Pizzaiola sauce, which is a tomato and bell pepper sauce. The garnish of pepperoncinis with the meat gives the dish a mild spice, which I thought went perfect with the meat and sauce. In a large bag or dish, cover the meat with the red wine, Worcestershire sauce and Frank's Red Hot sauce. Add 4 cloves garlic, 1 onion, ¼ cup parsley, 3 tbsp black pepper and 3 tbsp oregano to the mixture and evenly cover. Zip the bag or cover the dish and let the meat marinated in the fridge for about 5 hours. Once the meat is ready, preheat the oven broiler and remove the meat from the refrigerator. Begin the sauce by heating 2 tbsp olive oil in a large saucepan over medium heat. Add the diced onion, 2 cloves garlic, red bell and green bell peppers and cook until soft (about 5-8 minutes). Stir in the parsley, cilantro and oregano, then add the tomatoes and bay leaf. Bring the mixture to a boil then reduce heat and let simmer for 20 minutes. Pour the sauce into a blender and pulse until consistent throughout. Set aside and keep warm. Place the cut of meat into a well greased baking dish and broil on high until cooked to desired doneness (about 8 to 10 minutes per side for medium rare). Remove the beef from the oven and let rest for about 15 minutes. 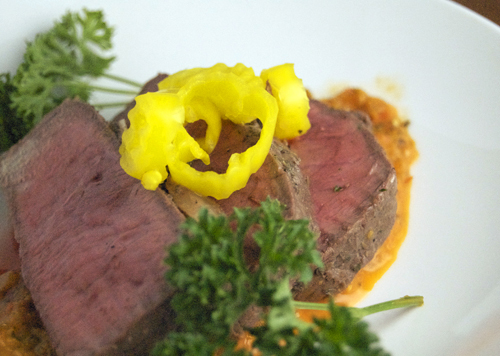 Slice the beef, drizzle with sauce and garnish with pepperoncinis to serve. Great sounding marinade and I love pepperoncinis! This looks awesome and should go wonderfully with my Tomato Bruschetta recipe! Going to the store right now! This looks delicious. I was living in London for 5 years and never had this meat. I got over that whole not cooking big chunks of meat for two people years ago. Now I make it all the time, and repurpose the leftovers into lunch the next day or a new dinner the next night to save on cooking time. Sounds delicious! This recipe sounds delicious. I agree completely with large cuts of meat too. They always turn out so juicy and delicious. I think I’m going to head out and get a roast so I can try this. I’m always looking for new roast recipes. This looks moist and delicious – cooked perfectly! The sauce sounds amazing! The bigger the better, this is a manly man meal but ladies won’t shy away from it. I personally tried this, and wow it blew me away. Good Job Jenny, keep up the good work!